It was four days before the privates taken at Fort Washington had one morsel to eat. They were given a little moldy biscuit and raw pork. They were marched to New York, and Daniel was lodged with many others, perhaps the whole company, in the Old Sugar House on Liberty Street. Daniel was held prisoner for four months under harsh conditions of starvation and exposure where he nearly died. There was no glass in the windows and scarce one of the prisoners was properly clothed. When it snowed they were drifted over as they slept. One day Daniel discovered in some vats a deposit of sugar which he was glad to scrape to sustain life. A gentleman confined with him in the Old Sugar House, used to tell his descendants that the most terrible fight he ever engaged in was a struggle with a comrade in prison for the carcass of a decayed rat. 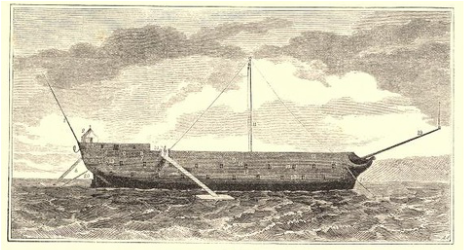 The Jersey Prison Ship which the British used to hold American prisoners during the Revolution. It is possible that Henry Bedinger, an officer on parole in New York, may have found some means of communicating with his young brother, and even of supplying him, sometimes, with food. Daniel, however, was soon put on board a prison ship, possibly the Whitby, in New York Harbor. Before the first exchange was effected the poor boy had yielded to despair. He had turned his face to the wall to die. How bitterly he must have regretted the home he had been so ready to leave a few months before! And now the iron had eaten into his soul, and he longed for death, as the only means of release from his terrible sufferings. “Overcome by his feelings my father knelt by the side of the poor emaciated boy, and took him in his arms. He then bore him to a house where he could procure some comforts in the way of food and clothing. After this he got an armchair, two pillows, and some leather straps. “He placed his suffering and beloved charge in the chair, supported him by the pillows, swung him by the leather straps to his back, and carried him some miles into the country where he found a friendly asylum for him in the house of some good Quakers. There he nursed him, and by the aid of the kind owners, who were farmers, gave him nourishing food, until he partially recovered strength. “But your father was very impatient to get home, and wished to proceed before he was well enough to walk, and did so leave, while my father walked by his side, with his arm around him to support him. Thus they traveled from the neighborhood of Philadelphia, Pennsylvania to Shepherdstown, Virginia, of course by short stages, when my father restored him safe to his mother and family. [i] Opening stanza of a Philip Freneaus’s poem describing the horrors and suffering of himself and other prisoners aboard the prison ships, quoted by Danske Dandridge in “Prisoners of the American Revolution.” Philip Freneau of New York, the poet of the revolution, as he has been called, was of French Huguenot ancestry. [ii] “A Boy in Prison”, p. 59-63, in Dandridge, Danske, 1910, American Prisoners of the Revolution, edition of 2005, D. N Goodchild, Philadelphia, 369 p., pp. 59-63 and Dandridge, Danske, 1909, George Michael Bedinger, A Kentucky Pioneer: The Michie Company, Printers, Charlottesville, Virginia, 232 p., p. 23-32. [iii] William Morgan was the son of Richard ap Morgan and the father of Col. Abraham Morgan who married Anna Maria Bedinger the sister of George Michael Bedinger. [iv] This very touching and convincingly factual narrative by George Michael’s son, Dr. B. F. Bedinger, does not include the fact that before he assisted Daniel home to Shepherdstown, George Michael returned to his Company and was in the Battles of Piscataway and Germantown. After his three month term of duty was completed, George Michael returned to the his brother at the Quaker home.